When I was 24, I decided it was high time I did my O.E - The Kiwi (New Zealand) term for "overseas experience" before I hit old age. To my surprise, my parents didn't look as excited as I was when I announced my plans. Well, you know how protective most parents are, particularly Asian parents or so I thought. Now that I'm a mom, I'm planning to lock L up and throw away the key AND her passport until she's 40. My poor parents. This was back in the days where global roaming and wi-fi were unheard of and no one carried laptops. I was a single woman traveller and loved heading off to unheard places. Thinking back, they must have been a nervous wreck until I finally got home - after I managed to get myself pickpocketed and lost all my money and passport. I think they were rather relieved when I finally got married and Steve had to come along to my "grand" backpacking adventures to "protect" me. I spent two months exploring Greece. 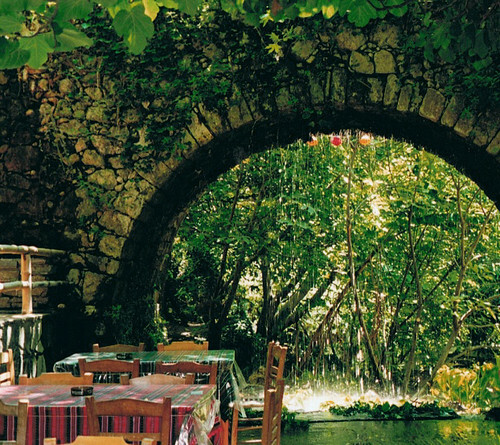 The most memorable experience by far has to be Argiroupolis in Crete. I read about it in Rough Guide and thought it'd be a neat place to visit. It was not a tourist destination and the place rarely gets any visitors. I hopped on the bus from Rethymno, along with the locals (I was the ONLY foreigner) and chickens, lots of them running up and down the bus. The landscape was rocky, jagged, dry, barren and mountainous. I learned that Argiroupolis was built on top of an ancient settlement called Lappa, a properous city of 10,000 inhabitants until it was destroyed by the Arabs in 828 A.D. In 1822, the new town was re-named Argiroupolis. Argiro (comes from the word Argiros) meaning silver" where according to the legend, people used to make silver and copper coins there. When I was there 12 years ago, the town had 450 inhabitants, 200 houses and 32 churches. I came with the intention of staying a night and instead, I didn't leave until 5 days later. The Zografakis took me in and treated me like a family member. We talked, we laughed and most of all, we enjoyed each other's company. 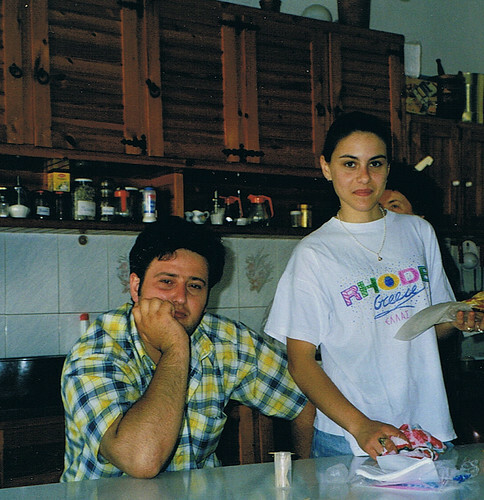 Mrs Eleftheria Zografakis taught me how to cook the local cuisine - stifadho (rabbit stew), tzatziki, different versions of Greek salad, meatballs with tomato sauce, stuffed tomatoes and capsicums, courgettes with eggs, courgette flowers with cheese, grilled chicken and souvlaki. I was taken to archaeological sites only known to the locals. Apparently, I was the first foreigner to see the newly discovered catacombs. Mrs Zografakis treated me like her daughter. She was the only female carpenter in Europe. In fact, she was completely self taught, purely out of necessity. She built the house along with the beds, cupboards, tables and chairs! 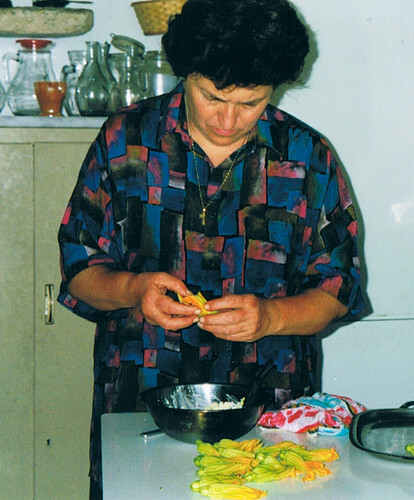 She looked after 4 daughters, managed the guesthouse, ran the restaurant, grocery store AND the orchard. The locals decided I was a celebrity based on two facts. First of all, I'm Asian and dabbled in martial arts (in my younger days) so therefore, I must be the daughter of Bruce Lee. I'm the first and only person of Asian descent the entire village has ever seen. Secondly, I'm from New Zealand so I HAD to be a friend of Xena's (Lucy Lawless aka Xena was all the rage back then). I was papped everywhere I went and had to sign autographs for the kids. I decided I have no talent for being famous. I didn't know how to dress the part nor smile for the camera. The principal of the local school invited me to teach and "perform" for the students. Their faces fell when they realized I 1) couldn't jump over a car 2) fly in the air nor 3) perform acrobatic acts in the air, of course - like Jackie Chan or Bruce Lee. When I finally ended my rather lackluster performance, a little girl ran up to Polly, my young interpreter. "I don't want her to leave", she whispered. Maria, the teacher asked if I could come back again next year. She made me promise her several times to send a postcard and photos when I returned home. I've never forgotten the warm welcome and immediate acceptance by the people of Argiroupolis. The mealtimes were extremely interesting. It was different from what I was used to. Everyone talked loudly, joking, clamouring for food, arms flung in all directions and plate after plate piled with food were passed around simultaneously. It was like a marketplace. I loved it! For lunch, we had a tray of an entire lamb with the head attached (! ), baked potatoes, preserved red peppers served with olive oil, vinegar, salt and chopped onions, courgette flowers filled with cheese and fried in batter, greek salad, artichokes with vinegar and olive oil, tzatziki and fried tender pork, accompanied by freshly baked bread and washed down with beer and coke. The dessert was a wonderfully sweet and juicy melon (a cross between rock and honeydrew melon). We started eating at 2pm and didn't finish until 9.30pm. This family welcomed me with open arms and they've touched my life in more ways than one. The area provides water to the entire city of Rethymno. The water suddenly appeared when someone prayed for a cure. The person was miraculously healed and so did a lot of others. The water that flowed from the stream is crystal clear and clean. It actually tasted good. 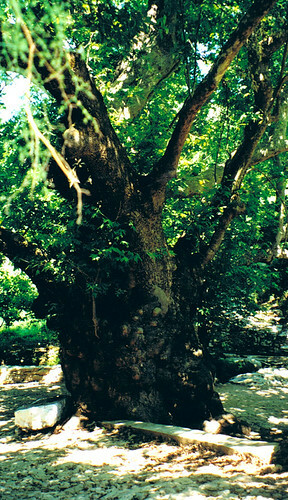 This is a 2000 year old tree where 5 young virgin girls were murdered by the Turks. Their bodies were buried in the church nearby. Please forgive the terrible photos. They were taken with a Ricoh point and shoot which my dad loaned to me and scanned using my cheap printer. The camera died a few times but a few whacks against the concrete would resurrect it. Oops, sorry Daddy, you weren't meant to know that. What a great avenue to relive your travelling experience and those ingenious details to share with us !! Thoroughly enjoyed the read . Any contact with those lovely folks ? Thanks, Mi. Lost contact with them but found them on google. We're hoping to visit them sometime this year. Amazing O.E. story - really off the beaten track! Thoroughly enjoyed reading it too. Can't wait to see and feel what you've experienced back then! Thanks! I'm planning to make a surprise trip back to see the family. I'll write another off the beaten track story once I've scanned the negatives into a digital format. One of my best friends is from Greece, I actually introduced her to her now English husband and they have now settled in Greece and work as teachers. I went to stay with my friend and her family back in 2004 for the Olympics and they took me on a day trip to Vasta where there is a small sacred church called the Agia Theodora which had trees growing on its roof! It is an important place for religious pilgrims and although not being of the same religion I found it very calming..your photos reminded me of how much I loved it there! I love Crete and have been there at least 10 times. The Cretans are very hospitable. For a long time I wanted to buy a house there, but never did. Just finished reading about your return visit. I did some animal rescue work out there one summer. Haven't been back for a few years, but am eager to do so. I forgot to add, have you seen the blog Organically Cooked? 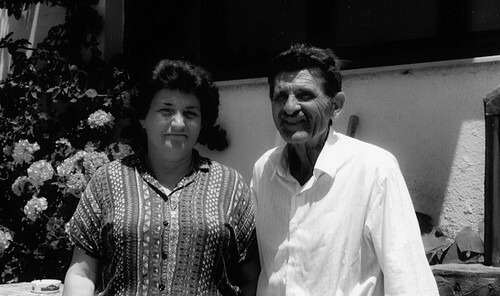 It's written by a Kiwi Greek woman who returned to live just outside Chania after her parents had moved to live in NZ. Hi Rachel, no I haven't but I'll do so right away. Thank you for sharing your experiences. I have a slightly different experience when i went back to Crete a couple of years ago. I'm not sure if it was brought on by the economic crisis but the attitude towards the tourists weren't all that friendly.